CTV NEWS (Aug 2) Winnipeg’s Mara George, who trains with Revolution Diving, is this week’s CTV Sport Star of the Week. WINNIPEG FREE PRESS (July 29) Local diver Mara George has jumped into the deep end of national competition. The 18-year-old from Wildwood won two medals at the Speedo Juniors Elite National Diving Championship. MYTOBA (July 24) On Saturday night, George won a bronze in the three-meter Women’s A group at the 2016 Speedo Junior Elite National Diving Championships. 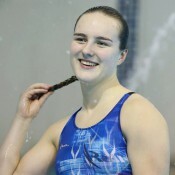 Back on Friday night, she won silver in the one-Metre Women’s A Group event. GLOBAL NEWS (July 22) A Winnipeg diver won a silver medal at the Speedo Junior Elite National Championships on Friday at the Pan Am Pool.